The vampire has long held our fascination, and its presence may be traced through archaeological discoveries, oral traditions, and ancient texts. Its nature varied greatly from one culture to another and one era to the next-until the twentieth century. What happened? Three Irish writers-Charles Robert Maturin, Joseph Sheridan Le Fanu, and Bram Stoker-each used this figure of folklore in his fiction and over the course of the nineteenth century created a universal mythological figure that culminated in Stoker's Dracula, a character that would serve as the foundation from which twentieth and twenty-first century writers would build the modern vampire. Maturin, Le Fanu, and Stoker did not purposely set out to transform the vampire of regional tales into a globally recognized phenomenon, as their biographies show. 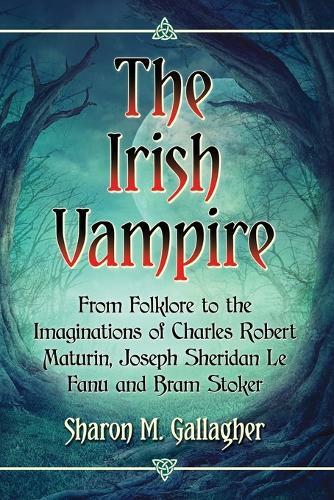 Their personal lives, national concerns, and extensive reading unconsciously seeped into their writing which not only struck a chord with their readers but made their vampires distinctly Irish, especially when compared to existing vampire folklore and fiction. While their works have separately been the subjects of many thorough critical studies and Stoker and Le Fanu are often discussed together, this may be the first time that a text groups all three together to trace the progression of the nineteenth century literary vampire, includes biographical and historical elements, and argues that the modern vampire has its roots in Irish nineteenth century literature.